Tradition holds that by our modern calendar, on April 24, 1479 B.C.E the Trojans learned they should beware of Greeks bearing gifts, especially when they come in the form of large wooden horses. The story goes that after ten long years of warfare, the Greeks, unable to break through the city of Troy’s walls by conventional means, came up with a sneakier way to achieve their goal. Led by the formidable Odysseus, the Greek troops made a show of burning their camp and sailing for the island of Tenedos, leaving the impression they had grown tired of twiddling their thumbs outside Troy’s city gates. 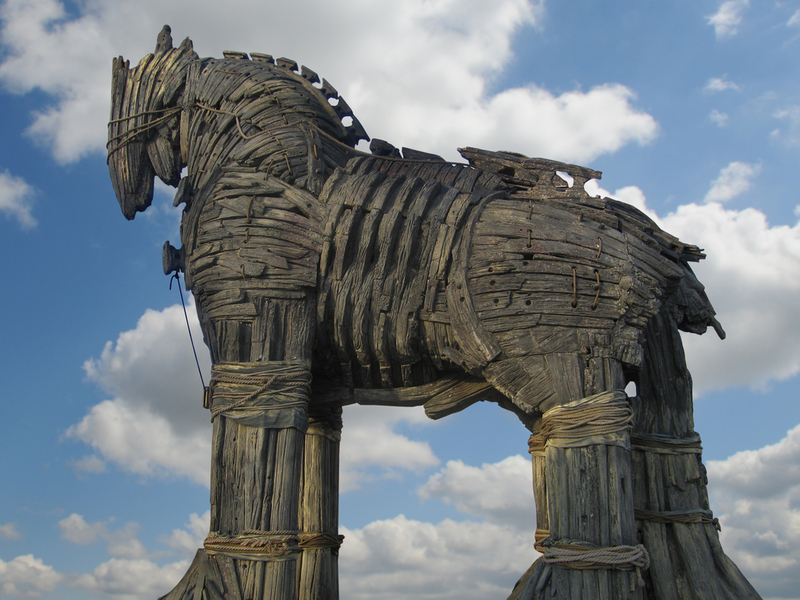 But just before they departed, the Greeks left a large wooden horse outside the gates as a gift for the victorious people of Troy. A large wooden horse with forty soldiers hidden inside. The Trojans opened the gates and wheeled in their prize, much to the amazement of the jubilant crowds. Everyone in Troy came out to celebrate the victory, and partied like Dionysus was in the house. The wine flowed freely, and when everyone finally passed out in a drunken stupor, the Greek soldiers emerged from their hiding place within the wooden horse. It wasn’t pretty. The Greeks pillaged the city, killing all the males, even the infants. They enslaved all the females, and anything of any worth was hauled away. They razed the town to the ground until there was nothing left but corpses and rubble. These are the tales told by the epic poems “The Odyssey” by Homer, and “The Aeneid” by Virgil. Though both were considered factual accounts of actual events in ancient times, we consider these tales to belong to the realm of myth, although there may be archeological evidence to support the historical validity of Homer’s Troy. Homer said the classical city of Troy overlooked the Hellespont, which today is known as the Dardanelles. In the 1870s, an archaeologist named Heinrich Schliemann found evidence of several ancient cities in the area from that same time period, including several that met violent ends. Of course, none of this is proof that Homer’s tale of a soldier-filled horse is anything more than a good yarn, but it may lend credence to the idea that, at the very least, an actual war did occur inspiring the legends.